Certainly closely related to Drosera indica, the Australian Drosera hartmeyerorum (described 2001 by Dr. Jan Schlauer) is unable to produce hybrids with Drosera indica varieties, and develops unique clear visible yellow emergences which developed from glue-producing tentacles into a new plant organ that functions like a reflector for bright yellow light. This can easily be tested: looking at them through a magnifier or macro-lens, switching a torch on and off that points on the plant from above. The lens-headed tentacles now reflect the light and seem to glow nearly like LEDs. 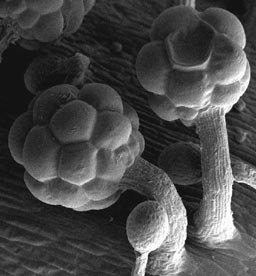 As the Scanning Electron Microscope (SEM pictures by Regina Kettering, USA) show, the former glue-producing tentacle-heads changed into a sophisticated hollow structure where approximately 12 transparent giant-cells act as lenses to focus the incoming light to some solid bright yellow cells in the middle. 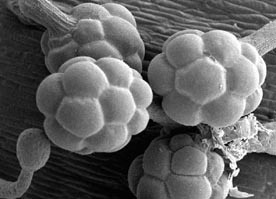 That structure becomes visible if the plant is dried for 2 days and the giant-cells collapse. The contrasting dark red colour on the trapping leaves and bracts even amplifies that glare. There are actually not only 5-9 emergences at the base of every trapping leaf, there are also 1-3 at the base of each bract on the flower stalks. But what are they all good for? This question caused a lot of discussions during the last 5 years. Considering the evolutionary advantage of this structure, two theories have been discussed. One possibility is a kind of mimicry known i.e. from some Passiflora species. Yellow to brownish coloured and elevated leaf-tissue looks like the eggs of a particular parasiting butterfly. Those females try to avoid competition for their own larvae and due to the egg-like tissue they will look for another egg free plant. A certain advantage for Passiflora. However, Drosera is a plant of prey and it's gluey tentacles powerful weapons also for bigger butterflys. We know that especially the annual sundews develop sophisticated strategies to catch as much prey as possible during their one and only season. It would be somehow schizophrenic for a Drosera to deter potential prey. The second theory predicts simply a more effective attraction of prey by the contrasting optical effect which guides insects deeply into the gluey plant. 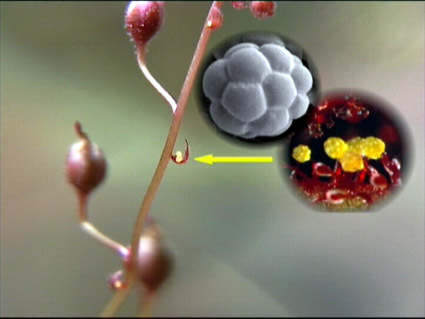 Several discussions on the phenomenon appeared on the Internet and Prof. Stephen Williams (USA, well known for his publications on the development and behavior of Drosera tentacles and the related Dionaea/Aldrovanda trigger hairs) offered us at the ICPS conference in Tokyo (2002) a co-operation to investigate the yellow emergences by SEM. Actually Regina Kettering (working together with Steve those days) examined the plant-material that we posted (grown from seeds, prepared with chemicals) and achieved some interesting pictures. It becomes clear that every reflecting lens is a single giant-cell. However, such X-ray pictures cannot display transparency, because the plant sample needs to be prepared with a layer of condensed metal vapour before. But combined with light microscopy the construction becomes clear. Operating a spot-light for filming in our greenhouse we found just coincidentialIy that the giant cells do not only look like lenses, they even act like lenses, focussing the incoming tropical sunlight at a yellow cell-structure in the centre. The reflected yellow light is very bright, shining actually like a spotlight from a black background for insects (dark red is invisible for insect eyes which are therefore able to see UV). Looking from top of the inflorescence down the stalk, these lens-tentacles appear like a chain of runway lights (sic) for flying and jumping prey. The discussions during the last years caused Irmgard and myself to find out even more about this puzzle. So again and again we looked at the video material that we shot at the natural growing sites to discover more details. First we found out, that other Drosera at the same sites (soil=silica sand) like D. burmannii and D. ordensis caught mainly ants. The big green, pink flowering D. indica seems to be specialised on flying insects like moths, small butterflys, flys, etc., but D. hartmeyerorum catches beside bees and midges mainly another prey: tiny baby-grasshoppers that live between the grass, frequently sitting in the upper part of the approx. 20-30 cm high grass blades. These appear alternatly with the upright pointing inflorescences of numerous D. hartmeyerorum which are scattered amongst the grass. 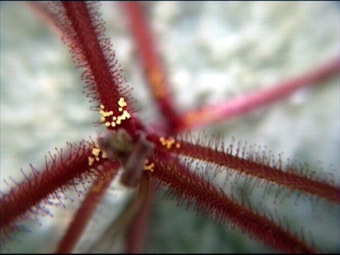 The flower stalk of D. indica is normally full of sticky glands and mostly growing laterally away from the plant, lacking also the lens-tentacles on the bracts. Up to this point the story sounds probably trivial, but it was in fact a lot of observation time to put the puzzle together. Actually one day at our tropical greenhouse I watched a small cockroach on the upper part of a D. hartmeyerorum inflorescence creeping slowly down until it came to the first bract (above the plant) where it stopped for some seconds. Suddenly it jumped down directly into the gluey plant obviously targeting the yellow tentacles. The cockroach was a little too big to be definitly caught and escaped but suddenly a clear picture appeared inside my brain. Once again I looked from above down the inflorescence to the plant which was illuminated by a 400W HQI-lamp. And realised what a baby-grasshopper (small enough to be caught) sitting on top of the upright inflorescence will see. Actually the yellow lens-tentacles on the bracts (number of bracts depends on the length of the flower stalk) are shining very bright yellow - indeed some how like runway lights - forming a "light chain" down to the first bract. From here the last 6-10 cm of the stalk are glabrous, but from the centre of the plant below groups of bright yellow "spotlights" are shining up very attractively . Now the distance from the first bract down to the plant centre seems to be ideal for the jump of a baby-grasshopper. If it jumps down to the light it will certainly be caught. This theory is also confirmed by the fact that juvenile plants below a size of 3 or 4 cm develop non or only 1-2 yellow emergences, plausible because they are too small to catch those particular grasshoppers (it seems to be more than only coincidence that 2001 as well as 1995 - on different sites - grasshoppers were caught in the majority of cases). If the trapping leaves produce more lens-tentacles for the first time it needs only several days, maybe 2 weeks until a first upright growing inflorescence appears. 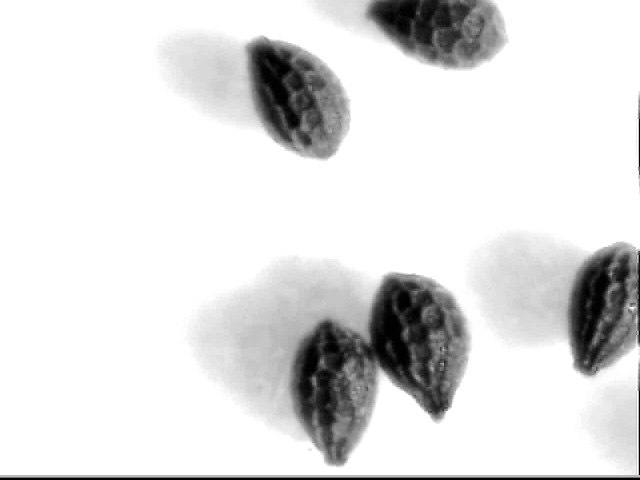 The seeds are minute - even for the whole genus - showing a typical honeycomb structure. 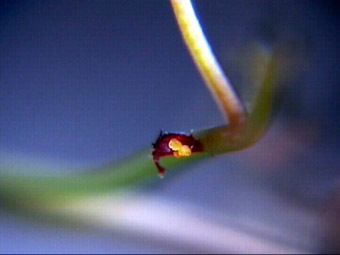 After germination seedlings are only one millimetre across but they are easily visible due to their typical dark red coloration. Now you face your first problem: they will only grow if they get protein! If you cannot provide springtails or other minute insects, you must feed them! We use a tweezers with magnifier and feed crushed fishfood flocks which is very effectiv. Without protein the plants will soon rot. If fed approx. all 10 days with appropriate portions they double their size during this time. Of course, this plant grows very quickly. In their tropical habitat they germinate about January to February and end of April we found them in full blossom. The seeds ripen within approx. 2 or 3 weeks and while the inflorescence is still growing on with numerous flowers the first seedpots open and the minute seeds are blown out and scattered around by the wind. This rapid growing and fruiting needs a lot of energy = prey which due to the nutrient poor silica sand can only be achieved if the trapping mechanism is very effective. Summarising the meanwhile known features of the annual D. hartmeyerorum it looks like a sophisticated trapping strategy using light effects for attraction. If this is really an adaption to catch specifically baby-grasshoppers - which are indeed very frequent in the area during the growing season - should be examined at different natural growing sites, counting lots of prey on a statistical relevant amount of plants. The still discussed theory that the lens-tentacles are developed for parasite egg mimicry to deter particular butterflies seems to be more and more unlikely. However, the unique runway lights make it very easy to identify this species and to distinguish it from D. indica. Thank you very much to Barry Rice, Stephen Williams and Regina Kettering for the permission to show their great pictures with our publications. Our video „Sophisticated survival strategies of the annual Drosera“ featuring the lens-tentacles of D. hartmeyerorum and the unique snap-tentacles of D. glanduligera on YouTube for the first time, awarded a 2nd prize in ChloroFilms Plant Biology Video Contest. 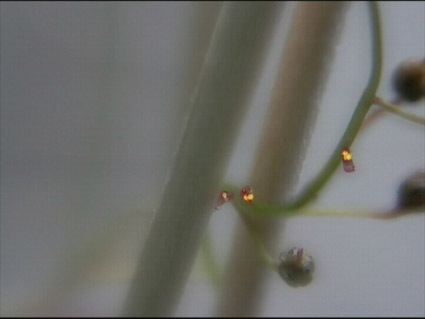 The footage is an excerpt from the DVD “Drosera: Snap-Tentacles and Runway Lights” which has been shown at the ICPS conference 2006 in Frostburg (USA). ChloroFilms is a nonprofit project started by Dr. Daniel Cosgrove at the Pennsylvania State University with initial grant support from the Education Foundation of the American Society of Plant Biologists (ASPB). Additional support comes from the Botanical Society of America, and Penn State Institutes for Energy and the Environment, and the Canadian Botanical Association. The ChloroFilms Contest is also powered by YouTube. The goals of Chlorofilms are to encourage production of informative, creative, and entertaining videos that promote a greater appreciation and understanding of plant life.